Murakami Gennosuke is a character from Stan Sakai’sUsagi Yojimbo comic book series. Also known by his nickname of Gen, Gennosuke is an anthropomorphic rhinoceros bounty hunter who sometimes accompaniesMiyamoto Usagi. 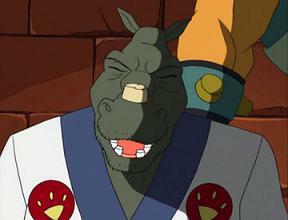 Gennosuke is first seen in the episode Big Brawl, Part 2. He retains his persona as a shady bounty hunter, but unlike in Usagi Yojimbo, he is a heavy gambler, as opposed to being a drunkard in the comics. In the Battle Nexus Tournament he defeats an unknown Clawed combatant in Tier 1, an unknownOctopus Contestantin Tier 2 and receives a free pass to the semifinals, where he loses to Kluh. Notably, Gen irritates the Turtles with his behavior, as well as Casey, who he calls “Saru” (monkey or ape). In the episode The Christmas AliensGen comes to the Turtles holiday party. In the episodeSamurai Tourist, inspired by a New York City citizen, Gennosuke dons an outfit nearly identical to Rocksteady’s. Gennosuke appears in Wedding Bells and Bytes for Casey and April’s wedding. When he realized he had to bring a present for the wedding, he tried to swipe Hisomi’s present as his own. Hisomi was not amused.